....NEW !!! 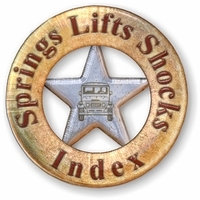 A CCOT Exclusive - HFS polyurethane spring bushings that are engineered for heavy off-road use, control, long life and comfort. You will feel the difference in positive handling and control of the new HFS Poly bushing. HFS Poly bushings have a shore A durometer rating of 80 and tensile strength near 5000psi. The typical durometer measurement will vary between 65 (soft) and 88 (hard). The typical bushing tensile strength measurement should not be lower than 2500 psi. Suspension engineers concocted the proprietary HFS urethane formula to work in combinations with heavy duty leaf springs (like HFS leaf springs) that require more wheel articulation / travel and comfort for street use. HFS polyurethane spring bushings have grease grooves to uniformly distribute grease across the entire inner bushing surface. The New HFS polyurethane spring bushings deliver what the 40 Series was designed to take and more! .... NEW !!! A CCOT Exclusive - HFS polyurethane spring bushings that are engineered for heavy off-road use, control, long life and comfort. You will feel the difference in positive handling and control of the new HFS Poly bushing. 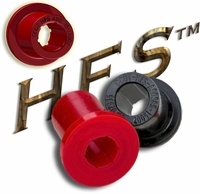 HFS Poly bushings have a shore A durometer rating of 80 and tensile strength near 5000psi. The typical durometer measurement will vary between 65 (soft) and 88 (hard). 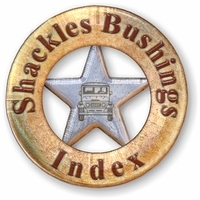 The typical bushing tensile strength measurement should not be lower than 2500 psi. Suspension engineers concocted the proprietary HFS urethane formula to work in combinations with heavy duty leaf springs (like HFS leaf springs) that require more wheel articulation / travel and comfort for street use. HFS polyurethane spring bushings have grease grooves to uniformly distribute grease across the entire inner bushing surface. Graphite helps to extend bushing life. NOTE: CCOT's New Graphite Rubber Spring Bushings are composed of Natural Rubber (NR) + Nitrile-Butadiene Rubber (NBR) + 5% Graphite producing an OEM style bushing that is shockproof, heat resistant, oil resistant and longer wearing than OEM. CCOT's Graphite Rubber Spring Bushings deliver a softer and squeakless ride at a great new price! 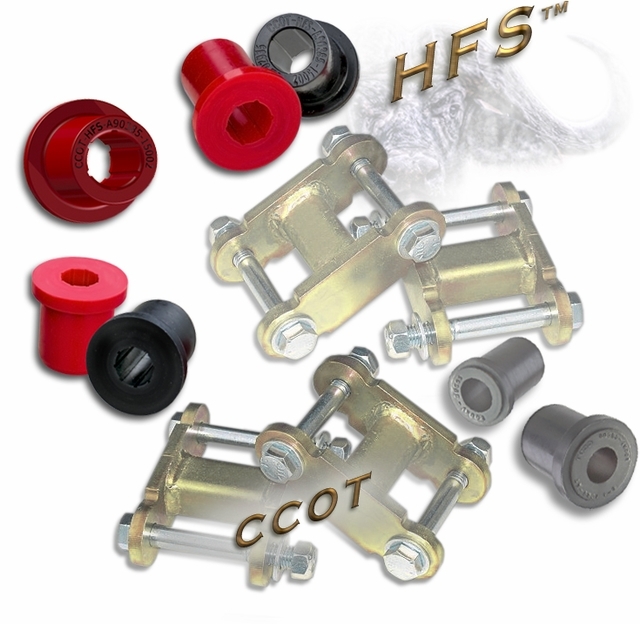 HFS polyurethane spring bushings that are engineered for heavy off-road use, control, long life and comfort. You will feel the difference in positive handling and control of the new HFS Poly bushing. 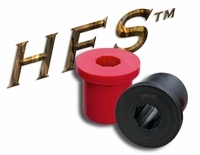 HFS Poly bushings have a shore A durometer rating of 80 and tensile strength near 5000psi. The typical durometer measurement will vary between 65 (soft) and 88 (hard). The typical bushing tensile strength measurement should not be lower than 2500 psi. Suspension engineers concocted the proprietary HFS urethane formula to work in combinations with heavy duty leaf springs (like HFS leaf springs) that require more wheel articulation / travel and comfort for street use. HFS polyurethane spring bushings have grease grooves to uniformly distribute grease across the entire inner bushing surface. 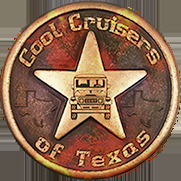 The New HFS polyurethane spring bushings deliver what the Land Cruiser was designed to take and more! 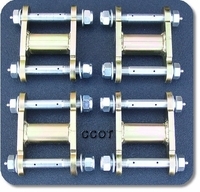 Best looking shackles on the market!